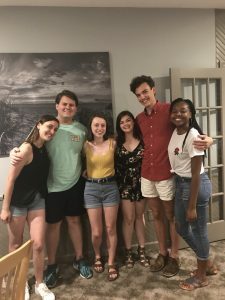 We are lucky enough to have one more summer with our wonderful Duke Scholars! We’ve got six great rising sophomores working with our summer academy this year, and we welcome them to our county. Last year the scholars helped hatch the idea for the Tour de Plantersville, a hit among those who attended. We hope to have an equally productive summer with our Scholars again, cultivating what they love while growing our program for the County. As you can see, they’ve got a very diverse set of skills. And that’s just half of them! They have already started working with our Plantersville Enrichment Academy, and will be here through the summer to help with the Plantersville Summer Academy. They’ll be doing everything from being in the classroom to keeping up with taking lots of pictures for us! Whatever they may end up doing for our programs, we sincerely hope that they will enjoy their time here as well as gain an immense sense of purpose and appreciation. We are so appreciative to have another year with the Duke Scholars, and we hope to see you all after this 10 weeks is up!